Episode #6 of Hindi TV Serial Tenali Rama is complete in its own and you can watch it regardless of whether you watched the previous episode or not. There were summer days and the corps in the fields needs to be watered regularly. One day when Rama was wandering in his farms, he found that the corps are drying. The seems not watered since a few days. Rama got to know that the worker responsible for watering haven’t visited since many days! And not only he but other farmers are worried too. He asks Rama that the days are came when a farmer have to take care for his farms and corps on his own, rather than being dependent on others. He also tell Rama one more important thing, when you are not familiar with or practise enough; every task is difficult to do! Nice dialogs! We also see the people worried about the rising problem of thieves. The burglary became almost common those days. There seems to be a group of thieves who are expert in their work and were able to rob everything from the house, without getting noticed. Even the people sleeping in the house didn’t get a slightest hint about what is going on! One night the thieves target Rama’s home! As all in the kingdom know that Rama is a courtier of the king and hence he must have a large amount of wealth available with him. But somehow Rama awake at the time the thieves are around his house. He then decide to play a game with the thieves. He and his wife puts all valuables from his home into a big a container and throw it into the well of his farm? Why? To keep it safe! But the thieves knew it already, so what is the point there? There will be one more burglary attempted at Rama’s home. Rama plays a trick to get the thieves caught. How he does it, is the rest of the episode. Will all his attempts got succeed or he taste some failure too? Well, you need to watch the episode to know more. The tricks Rama is playing sometimes look childish. The actors playing thieves and some other smaller roles are not as convincing as expected. What works for it is the content. It is not great, but it is surely no-nonsense and good to go for. 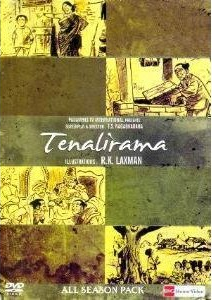 Tenali Rama’s tales are famous for its simplicity and its association with the day to day life. This tale works for that reason also. It doesn’t reflect anything in filmy manner but rather found grounded. Vijay Kashyap’s performance is good. In some scenes he looks doing acting but otherwise he is completely natural. The background music is good as with all episodes. The title song is what we expected a little better. If you are looking for some kids stuff then this is a good choice to go for despite of its some downsides.